New York's Bloomberg has powers Villaraigosa seeks, but his changes offer a lesson in conflict. February 27, 2006NEW YORK — Mayor Michael R. Bloomberg won control of this city's schools nearly four years ago and swiftly unleashed a dizzying string of reforms.Bloomberg and his schools chancellor, former federal prosecutor Joel I. Klein, slashed administrative jobs, ordered uniform reading and math programs and hired parent coordinators for New York's 1,400 schools.The pair converted warehouse-like high schools into smaller campuses and ended the practice of promoting failing students to the next grade. Their underlings even dictated how teacher bulletin boards should be designed.But the top-to-bottom overhaul came with a cost: The mayor and his schools chief have alienated teachers, parents and administrators, leaving many in the nation's largest public school system feeling disenfranchised and afraid to challenge City Hall. The changes in New York — and the stresses they have exposed — offer possible warnings to Los Angeles Mayor Antonio Villaraigosa as he weighs his own takeover of the Los Angeles public school system. 1. "But the top-to-bottom overhaul came with a cost: The mayor and his schools chief have alienated teachers, parents and administrators, leaving many in the nation's largest public schoolsystem feeling disenfranchised and afraid to challenge City Hall." 2. "Teachers and principals alike said the new top-down organization has fostered a climate of fear and intimidation." 3. "In New York, experts believe that mayoral control has allowed Bloomberg and Klein to push through their student retention policies, for example, because they faced no opposition from elected boardmembers. " 3. "They are able to crack the whip more than is common in most cities," said Jeffrey Henig, a political science professor at Columbia University's Teachers College who studies the politics ofschool reform. "They sometimes have gone in with a bit too much haughtiness … and cut themselves off from parent groups and teacher groups who know a lot from years of experience at the street level." 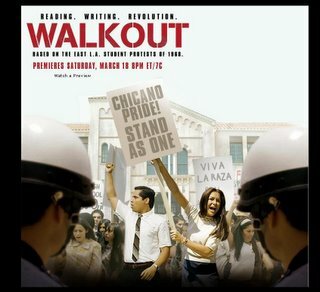 Edward James Olmos directs this HBO Films drama that tells the true but little-known story of a group of Chicano students who staged a compelling 1968 walkout to protest the injustices of the public high-school system in East Los Angeles. Starring Alexa Vega as Paula Crisostomo, an idealistic honor student who refuses to "play it safe" in a school system that clearly discriminates against Chicanos, instead banding with a group of activists to coordinate a multi- school walkout of students. Mentored by her charismatic teacher Sal Castro (Michael Peña), Paula learns that sometimes the price for progress is high -- but it's ultimately worth paying. 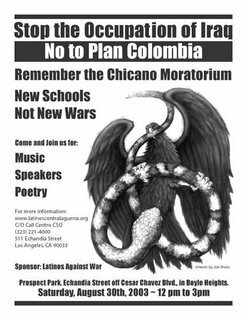 Objective: A 241 mile march that aims at ensuring thatthe Latino voice of opposition to the War is heard loud and clear across the Americas. WHAT/ WHEN: Fernando Suarez del Solar, Pablo Paredes,Camilo Mejia and Aidan Delgado will lead a coalition ofthe willing across this 241 mile quest for peacestarting in Tijuana, Mexico, going through Marine Corps Depot Camp Pendleton to the Cesar Chavez burial site inLa Paz, CA, culminating in The Mission district of SanFrancisco with a memorial ceremony and blood drive. The March will begin on 12 March 2006. The coalition ofthe willing will arrive at La Paz, CA on 22 March 2006 and culminate in San Francisco from 26 March 2006 to 27March 2006. WHY: Latinos represent nearly 15% of the US populationand 11% of the US military, with many serving in combator hazardous duty occupations. In addition, anestimated 20% of the fallen service members in theearly months of the invasion were Latino. With thecontinued growth of the Latino population and its vitalimportance to the future of this country, it is time for the Latino community to become an active and vocalpart of the 60%+ of US citizens that oppose this War.It is also time to show the Latino community that theyhave a voice and a right to fight for peace andstability. Fernando Suarez Del Solar is committed toself-sacrifice. At 50 years of age he cares more aboutending this war than even his own health. We make thiscall not only to the Latino population but to all thosewho agree with our message "No more bloodshed in Iraq". Why 241 miles? Last Year was the 75th anniversary of Gandhi's Salt March, one of the most impactful non-violent acts of protest and civil disobedience inpursuit of social justice in history. Gandhi marched241 miles to free India from British imperialism. This legacy has been vibrant in all Latino Social Justice movements. Cesar Chavez was a disciple of Gandhi. We wish to rekindle this tradition and one year after the75th , we wish to put Gandhi's spirit into practicerather than wait for the next milestone to honor hismemory. Fernando Suarez Del Solar Is the father of one of the first Latinos to die in Iraq. He was lied to about his son's death, but found thetruth in Iraq with the help of a well know recentvictim of the war, co-anchor of ABC's World NewsTonight, Bob Woodruff. Fernando's son Jesus stepped on an illegal US cluster bomb. Since then Fernando has been a tireless advocate for peace. Pablo Paredes Navy warresister who refused boarding an Iraq bound ship on Dec. 6th 2004. He was court martialed, sentenced andnow speaks out for Peace. Camilo Mejia Served one tour in Iraq and then became a National Guard war resister. He was jailed for nine months for his opposition to thewar and is now a prominent anti-war speaker and memberof Iraq Veterans Against the War (IVAW). Aidan Delgado Is a Conscientious Objector of the Iraq war. He served at Abu Gharib and now tours the country withslide shows of the prison abuses. Tijuana - The march from Tijuana across the US-Mexico Border is a symbolic gesture of Peace without borders. As Jesus Suarez del Solar was born and educated in this beautiful city, our marchwill also be born in Tijuana, and we also wish that our gesture serves to educate around border issues andpeace. Escondido Escondido is the city in which Jesuswas recruited and today is buried. We wish to trace Jesus' steps and then continue his fight for thechildren of Iraq and America in the name of peacerather than war. Pendleton Marine Corps Depot Camp Pendleton is the place where Jesus and many of ouryouth are trained for war. Jesus deployed fromPendleton to Iraq. We wish to rewrite history with our march and deploy our soldiers from MCD Camp Pendletonto La Paz. La Paz - La Paz translates to The Peace, and is the burial site of Cesar Chavez. We wish to evoke his legacy and lead our coalition to peace. San Francisco's Mission district is predominantly Latino. We will hold a service in the mission to commemorate Jesus. We will also stage ablood drive. The blood donated will be equally distributed to cope with Iraqi as well as coalition needs. The March will arrive in all the following cities:Tijuana, San Diego, Escondido, Camp Pendleton, SantaAna, Los Angeles, San Fernando, Palmdale, Rosamond,Keene (La Paz), Fresno, San Jose, and San Francisco. One of my favorite artists in the world is SF bassist and progressive activist Marcus Shelby. He's a true renaissance man ala Paul Robeson - not affraid to speak and write about social justice and to use his art to raise people's consciousness and spirits to struggle for a better world. I enjoyed a great evening last night at Yoshii's nightclub in Oakland with my school board colleague Mark Sanchez and my 5 year old daughter Jade to hear the Marcus Shelby Orchestra's performance and CD release of his latest 'Port Chicago' which was commissioned by the civil rights organization Equal Justice Society. Thanks to my friend and SF green party leader & school board candidate Kim Knox for introducing me to Marcus. Click here for more info on Marcus Shelby . generated by a nationwide campaign in support of the sailors compelled the Navy to revamp its policies and begin the process of desegregation-a major civil rights victory. 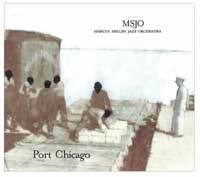 Although the imprisoned sailors were later released under a general amnesty after the war, their mutiny convictions have never been overturned. The injustice of their convictions cries out for redress, and reminds us of the price paid by many unsung heroes in the struggle for civil rights and justice. 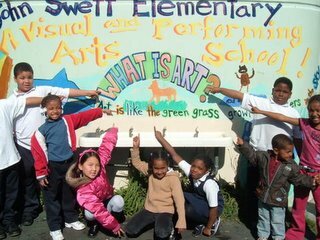 SF's John SWETT Elementary School - WE SHALL NOT BE MOVED! "I am a member of the get-along club" the excited voice of 17 year old Tamicka Baker, blasted through the phone. POOR staff had been referred to this powerful young African descendent woman by her mother, Anitra Baker, mentor , teacher and paid parent laison at John Swett Elementary School. 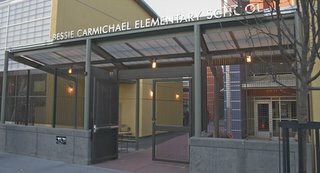 John Swett, an elementary school located in the Western Addition neighborhood, is one of the schools slated for closure and then subsequent merger with John Muir Elementary School by a 4-3 San Francisco school board vote. For the many dedicated, involved and engaged, parents, grandparents, uncles, aunties, cousins and friends who make up the innovative, multi-cultural, multi-generational mix that is John Swett, this was more than a blow, this is the devastation of a community. There are other words that come to mind for the closure of this majority African Descendent school located in ground zero of the Western Addition aka Fill-no-more, which effectively "relocated" and "removed" several thousand of its Black residents not so many years ago under the myth of "redevelopment. Words like Diaspora, descimation and destruction. As parent and grandparent of a 2 and half year old boy, Dee ( my mother and co-editor of POOR) and I’s worldview is informed by Afro-centric values which means we are already feeling the struggle to be involved and stay involved in the life and education of a child once they enter a Euro-centric (Amerikkkan) public school system. A system based on Western values of separation and independence which inherently does not respect the direct involvement of parents and grandparents in the learning, teaching, and mentoring process of a child while he or she is on school property. A system not based on eldership and interdependence. It’s a proximity issue; there are two schools in the Western Addition, John Swett, a somewhat small school which has an 81% enrollment versus John Muir which is a large school which is under-enrolled with 55% capacity. Mark went on to describe another more problematic, highly controversial use for the John Swett School, i.e., its proximity to the school board and therefore convenient office space for the School board [or 'school district']. “If the proposed merger goes through it would be very difficult to replicate the programs and teachers and community that exists now in John Swett, I know of at least one dynamic teacher who is not planning to move to John Muir,” Mark added Mark’s reference to “the programs lost in the merger” would be Swett’s extremely innovative arts-based curriculum, which unlike John Muir is not based on the No Child Left ( Alive) Behind scripted curriculum inspired mandates that many conscious teachers and parents find harmful to students. Mark continued, “Mergers are not the only way to deal with these kinds of issues, for example Ortega and Sheridan were not merged, because they are going to pursue becoming K-8 schools,” Mark concluded, “A sustained amount of protest can urge the board to bring the school up for discussion." Religious leaders and protestors join a small rally outside San Quentin prisonto voice opposition to the death penalty. Moments before it was announcedMorales' execution had been halted. February 21, 2006, 7:00 p.m. The execution of Michael Morales will not occur tonight due to a Federal Court order the State of California certified it could not meet. Morales, 46, was originally scheduled to be executed by a three-drug lethal injection. Convicted murderer Morales was scheduled to die at 12:01 a.m. today, but the time was pushed back to 7:30 p.m. due to anesthesiologists' refusal to participate. Throughout today the State sought permission to administer one five-gram injection of sodium pentathol rather than the usual three-injection series which begins with anaesthesia. Federal Judge Jeremy Fogel granted the request this afternoon but ordered the injection be administered by medical professionals. "Accordingly, while defendants may proceed with the execution this evening using only sodium thiopental, they may do so only if the sodium thiopental is injected in the execution chamber directly into the intravenous cannula by a person or persons licensed by the State of California to inject medications intravenously. The dosage used shall be at least five grams of sodium thiopental to be followed by a 20 cc saline flush as provided in Protocol No. 770,'' Fogel wrote in a ruling issued this afternoon. That requirement apparently spared Morales his life tonight. Shortly before 6:30 p.m. the California Attorney General's Office announced the State could not assure medical professionals would administer the injection. Crittendon said San Quentin Warden Steven Ornoski made the decision to indefinitely postpone the execution at about 5:45 p.m.
"After lengthy discussions, the decision has been made that the state cannot proceed with the execution under the conditions set by the district court,'' Ornoski's statement read. Crittendon said prison officials expect that an evidentiary hearing will take place May 2 or 3 on the constitutionality of the state's lethal injection process. The announcement halted the 7:30 p.m. scheduled execution now thrown into indefinite delay. Check out The Pinoy Teachers Network - be part of a growing network of Filipino teachers from all over the world. Exchange stories and learn more from each other! to our fight for bilingual education and language equality in the Lau vs. Nichols Supreme Court case from 1974. [Jim Crawford's Language Rights Website is one of the best around]. 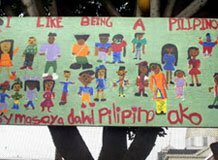 PEP project at Balboa High School led by my SF State University Asian American Studies colleague Allyson Tintianco-Cubales. Many of these types of programs came about because the community demanded them and are keeping the pressure on the school board and district. The South of Market Community Action Network - SOMCAN - is one group that is working with grassroots community forces to support these programs and to hold the school district and City accountable to the low income immigrant communities. Aint Gonna Let Nobody Turn US 'Round! Come to any of the sessions: they are designed to be independent of each other but also build upon each other. A brief introduction to the Liberation Curriculum at the King Institute will be given at each session with curriculum handouts relevant to that night’s topic. Film: With All Deliberate Speed (excerpts, 2004) History ignored is history repeated. In the case of Brown Vs. Board of Education that the concept of "separate but equal" school segregation was unconstitutional. But in this landmark ruling, the Justices used a four-word phrase that many believe has delayed the process of change for over 50 years: "With All Deliberate Speed." 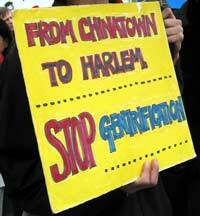 company, the union and white co-workers to break out of the black job ghetto. nonviolent weapons were taken up by black college students in Nashville, Tennessee. Disciplined and strictly nonviolent, they successfully desegregated Nashville’s downtown lunch counters in five months, becoming a model for the entire civil rights movement. 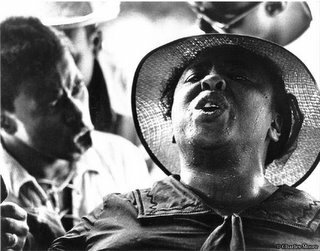 Film: Standing on my Sisters’ Shoulders, (60 min, 2002)Most of us have never heard of Fannie Lou Hamer, Annie Devine, Unita Blackwell, Mae Bertha Carter, or Victoria Gray Adams. 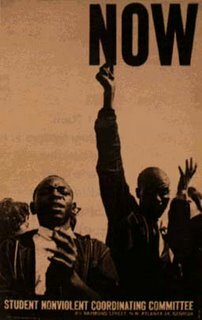 But in a state where lynching of black males was the highest in the nation, a unique opportunity for women emerged to become activists in the movement. Dozens of SF teachers rallied this evening to urge the School Board and New Superintendent Gwen Chan to 'show some love'! With Valentines, a big kind-of-ugly cupid-guy, candy and big heart shaped signs calling for safer schools, fair pay and equal protection, the teachers and community supporters raised awareness about much needed raises and fair compensation for workers in the school district. United Educators of SF is fighting for a fair contract within our school district. ...But the “reverse” was not complete until this morning, when the President sent Congress his fiscal 2007 budget request. The $54.4 billion that the President this morning asked the Congress to appropriate for the Department of Education for the coming year is $2 billion below the level available for the current year. Real per capita spending under that budget will plummet to $165, or $3 less than the level contained in the appropriation bill signed by President Clinton a few weeks before Bush was sworn into office. The Bush team will no doubt argue that money can’t fix everything—that there are issues in education that won’t go away no matter how much money you throw at them. That may well be true, but it is also true that you can’t expect class sizes to go anywhere but up and you can’t expect teacher quality to go anywhere but down if you reduce the funds available to local school districts. The burden of the increased testing now mandated by the federal government simply adds to the downward financial pressure. Even more distressing is the fact that the new Bush budget appears to plan for continued cuts in federal support of local schools for the foreseeable future. 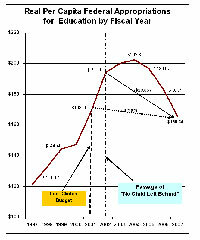 All of the increased support of local schools achieved during the Clinton administration (in real per capita spending by the Department of Education) may well be eliminated in the final two budgets of the Bush administration—the administration that used education as a measure of its compassion. This is necessary to offset a tiny fraction of the debt being created by tax cuts focused on the most well-to-do in our society. FULL ARTICLE by Scott Lilly. President Bush sent Congress a $2.77 trillion budget plan on Monday that would boost spending in the war against terror but squeeze a wide swath of other government programs to deal with exploding budget deficits. Bush, hoping to get his domestic agenda back on track after a year of political setbacks, unveiled a budget blueprint with a heavy emphasis on keeping the country strong militarily. It would also make his first-term tax cuts permanent, at a cost of $1.4 trillion over 10 years, and still achieve his goal of cutting the deficit in half by 2009. Almost one-third of the targeted programs are in education including ones that provide money to support the arts, vocational education, parent resource centers and drug-free schools. Senate Minority Leader Harry Reid Achieving these two goals constrained Bush's efforts to offer new initiatives although he did put forward a few mostly modest programs to deal with American anxieties about global competition, soaring energy costs and skyrocketing medical bills. For the past two years, the United States has been quietly pursuing its largest anti-immigrant campaign in 50 years. With the U.S. losing the war in Iraq, President Bush, right wing Republicans and even many Democrats are once again using immigrants as scapegoats (along with promising more money for domestic programs, tax cuts for the rich, faith-based initiatives to attack abortion rights and the rights of LGBT people) in order to secure conservative/right-wing votes for the November 2006 midterm elections. Attacking recent immigrants is historically nothing new. Since the Chinese Exclusion Act of the1890's, different immigrant groups have been targeted when they begin arriving in this country: Irish, Jews, eastern Europeans, Japanese, Filipinos have all been the target of attack at various points in U.S. history. This time the forces of racism are once again spinning rhetoric to blame immigrants (especially the Latino immigrants) for causing all the world's problems--arguing that they could be potential terrorists who wish to harm our country and 'welfare queens' who plan to steal money from our social programs--a potent scare tactic which exploits the fear and anger of the poor and working-class communities, who are the victims of corporate downsizing and the government's budget cuts because of the war in Iraq. Not surprisingly, the right-wing anti-immigrant forces have been using the Minutemen campaign to exaggerate the so-called "crisis" of undocumented immigrants after September 11. What happened in 2005 was a chain of events, each one carefully crafted to build to a climax of mindless xenophobia. From the first appearance of the Minutemen in the beginning of the year to the passing of the Sensenbrenner-King Bill right before the year's end, this was a well coordinated plan serving the agenda of the right-wing, racist anti-immigrant forces, and most immigrant, community and social justice activists were caught-off guard. What Should Activists Do Next? Our struggle will be long and hard, but that doesn't mean we should give up hope. While the House vision of the Sensenbrenner-King Bill has passed, we still can mount a strong opposition against the upcoming Senate version, which will be introduced and debated sometime in February, 2006. Unity is very important! This is NOT only about immigrant rights--it is also about human rights for everyone. An injury to one is an injury to all! invade/occupy Iraq/Afghanistan = tax cut = faith-based initiatives. They are also calculating that the left will not unify strongly enough to build a broad-based coalition to support each other's struggles.We should prove them wrong! Now that we have finished the holiday season, we should gear up our fighting spirit and channel it into building multi-ethnic community actions against the final passage of the Senate bill early this year. Immigrant groups around the country are beginning to build local coalitions to organize campaigns against the bill, against the passage of another proposed anti-immigrant bill--the CLEAR Act, and against the renewal of the PATRIOT Act. In addition, we should not underestimate the powerful forces behind the current anti-immigrant movement, and the "divide and conquer" tactics they are using. Minutemen understand they cannot build their movement in the major U.S. cities, so they tactically choose several suburban/rural right-wing, conservative anti-immigrant communities in which to build their base (i.e. Orange County, CA). These are regions where the anti-war/anti-globalization movements generally don't organize, and it is in places like these that the Minutemen enter candidates in elections hoping to win a seat in the local government. Therefore, activists and organizers have a particular responsibility to point out the links between Katrina's impact, immigrant rights, civil liberties, labor rights and the U.S. war in Iraq. Understanding the connections between our individual conditions of life and the lives of people everywhere in the world allows us to come together and organize across all borders. We need to make the connections between: wars in Africa, south America, Asia, Iraq, Palestine and Korea, and sweatshops in Asia as well as in Los Angeles and in New York; international arms sales and the WTO, FTAA, NAFTA & CAFTA with AIDS, hunger, our reproductive rights, child labor and child soldiers; multinational corporations and economic exploitation with racism, homophobia and poverty at home--then we can win the struggle. Lee Siu Hin is a community organizer with the National Immigrant Solidarity Network (NISN) http://www.ImmigrantSolidarity.org and ActionLA Coalition http://www.ActionLA.org. Please visit NISN's Minutemen Watch http://www.MinutemenWatch.net for more of the latest news on counter-Minutemen campaigns. 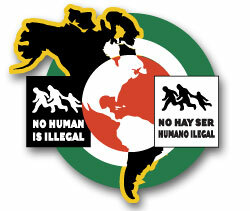 Justice for Immigrant Youth: Speak Out! About 500,000 young people live in the U.S. withoutlegal immigration status. The only home for most of these youth is here in the U.S., but everyday they face the risk of being sent back to their “home”country. And without legal papers, they have many less opportunities for jobs and an education in the US. Justice is not given, it’s demanded! Immigrant youth deserve a chance. That’s why somemembers of Congress have drafted a law to help young immigrants get legal status. This bill is called “TheDREAM Act,” and it has the chance this year to become law. We need to mobilize so that the public and government hear us loud and clear: We all deserve to make our hopes into reality, pass the DREAM Act! We are forming a Bay Area campaign to educate andadvocate around the DREAM Act, as well as other issues impacting immigrants and immigrant youth. We are looking for leaders who can help drive this campaign.There will be a leadership group to meet in earlyMarch, to form a strategy for community education,advocating to our members of Congress, and getting theattention of the newspaper, TV, and radiomedia. (510) 451-2846, ext. 309 orby email at asinha@iieb.org. You can also drop by our downtown Oakland office, at449 15th Street, 2nd Floor (right off the 12th St/CityCenter BART line).